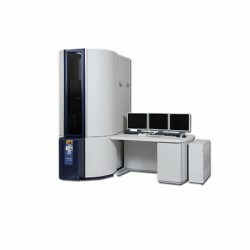 Field Emission Transmission Electron Microscope HF-3300 Call to price •Cold field emission electron source benefits nanoscale analysis with its high brightness and high energy resolution. 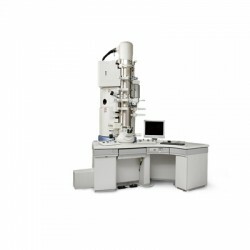 Its inherent high coherency greatly contributes to ultrahigh resolution imaging and electron holography*.300kV accelerating voltage •300kV accelerating voltage allows atomic resolution imaging for thick specimens. Metals and ceramics with high atomic numbers are less electron transparent and often need to be observed at 300kV accelerating voltage.Unique analytical capabilities •Newly introduced spatially resolved EELS* and in situ SEM/TEM imaging* nanobeam electron diffraction provide sophisticated and unique analytical capabilities.Holder linkage with FIB system* •Hitachi FIB-compatible specimen holder* requires no tweezer handling of TEM grid between FIB fabrication and TEM observation and ensures high sample throughput TEM analysis. 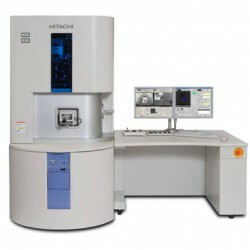 Hitachi's unique specimen rotation holder* enables real-time multidirectional structural analysis together with STEM unit*.User-friendly operation •Windows-based TEM/STEM* computer control, motor-driven movable aperture, and 5-axis motor stage make the high-end TEM more easily to access, 10 minutes high voltage ready and one minute specimen exchange result in high sample throughput for TEM analysis. 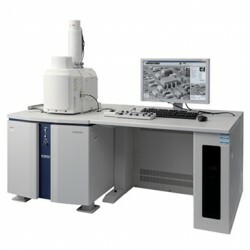 Transmission Electron Microscope H-9500 Call to price User-friendly operation •Windows®* compatible GUI design •High specimen throughput, 1 minute for specimen exchange and 5 minutes for voltage ramp up (300 kV) and beam on. Stable high resolution microscopy •Point-to-point resolution of 0.18nm and lattice resolution of 0.1nm •A stable 5-axis eucentric goniometer stage Excellent performance reliability •Field-proven 10-stage accelerator gun design •High voltage resistor cable design Valuable optional accessories •Compatible specimen holder for use with Hitachi TEM, FIB and STEM systems •A variety of specimen holders that provide heating, cooling and gas-injection capabilities for atomic resolution dynamic studies. Hitachi Spherical Aberration Corrected STEM/SEM HD-2700 Call to price Cs-corrected high-resolution imaging & high-sensitivity analysis with unmatched throughput In the fields ranging from R&D to quality control of advanced nano materials and semiconductor devices, there have been increased demands in recent years for improving spatial resolution and analytical performance for electron microscopes. Aberration correction provides a prominent solution to these demands. 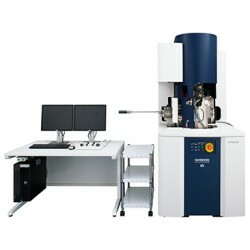 Hitachi High-Technologies had previously commercialized electron microscopes equipped with spherical aberration correction capability, since then continued efforts toward pursuing the concept of providing both high throughput and high performance benefited from aberration correction. The HD-2700 STEM with the newly developed Hitachi spherical aberration corrector realized this concept successfully. 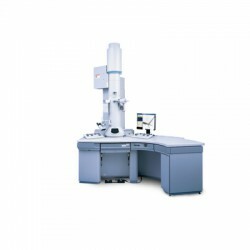 TM3000 TableTop Scanning Electron Microscope Call for price The TM3000 builds on the phenomenal global success of its predecessor, with over 1000 instruments installed. Now more advanced microscopy needs are addressed whilst maintaining incredible ease of use - pushing back the boundaries for the tabletop electron microscopy. Motorized Stage Version Call for price With the optional* motorized specimen stage,all functions of the TM3030 can be operated using the mouse alone. 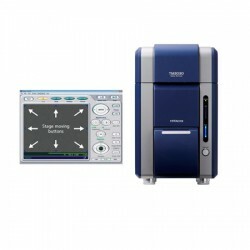 Real-time 3D analytical FIB-SEM NX9000 Call for price The newly developed FIB-SEM system from Hitachi, the NX9000 incorporates an optimized layout for true high resolution serial sectioning to tackle the latest demands in 3D structural analysis and for TEM analysis. 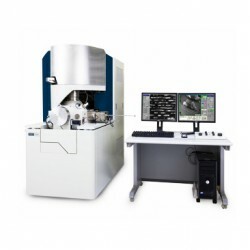 The NX9000 FIB-SEM system allows the highest precision in material processing for a wide range of areas relating to advanced materials, electronic devices, biological tissues and a multitude of other applications. 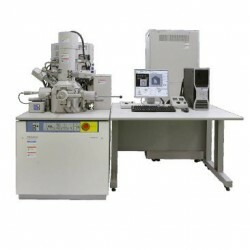 Energy Dispersive X-ray Spectrometer SwiftED3000 Call for price It is the useful tool for sample surface observation and screening analysis. 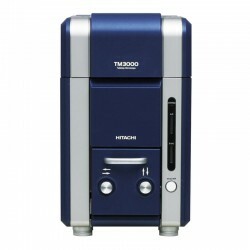 [VN] Kính hiển vi chùm ion hội tụ & điện tử quét Hitachi DUE'T NB5000 Call for price [VN] Hệ thống Hiển vi Chùm ion hội tụ & Điện tử quét (FIB-SEM) của Hitachi cho phép phân tích cỡ nano các thiết bị vi mô và vật liệu chức năng với hiệu suất cao chưa từng có. 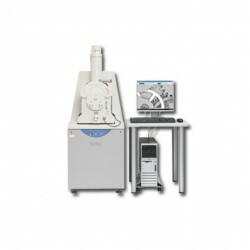 Energy Dispersive X-ray Spectrometer Quantax70 Call for price It is the useful tool for sample surface observation and screening analysis. 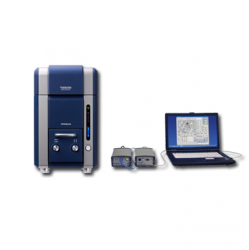 The HT7700 features superior high contrast and high resolution image quality and analytical capabilities for biomedical, pharmaceuticals, food industry, agriculture, polymer, chemistry and nanomaterials applications. Tilt Rotate Stage Call for price Tilt Rotate Stage enable observation at -15° to 60° degree angles. It is allowable to monitor the positioning in the sample chamber through a chamber scope. [VN] Kính hiển vi chùm ion hội tụ Hitachi FB2200 Call for price [VN] Sản phẩm thế hệ mới cho năng suất, chất lượng và độ chính xác cao hơn. [VN] Kính hiển vi chùm ion hội tụ Hitachi MI4050 Call for price [VN] MI4050 là hệ thống Hiển vi chùm ion hội tụ hiệu suất cao của Hitachi. Được trang bị hệ quang học thế hệ mới, MI4050 cho độ phân giải hiển vi SIM hàng đầu thế giới và chuẩn bị mẫu hiển vi TEM độ nét cao nhờ cải tiến độ phân giải ảnh ở thế gia tốc thấp. 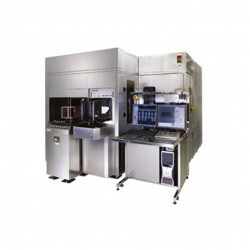 Technological advances in the Semiconductor Industry are occurring at a rapid pace and pushing design and manufacturing tolerances to the nano-scale. These advances require direct observation of the surface structures of the materials at this size scale. 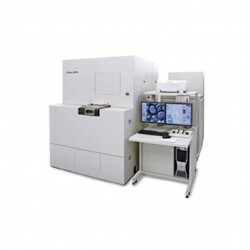 Hitachi has a proven track record for providing cutting edge instrumentation that are reliable and that meet the strict imaging requirements of the Semiconductor Industry. 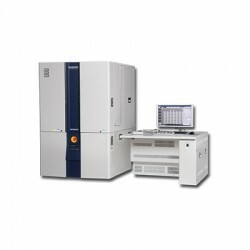 The SU9000 also features STEM (option) performance that guarantees 0.34nm resolution as confi rmed through the imaging of graphite lattice ( (002) d=0.34nm) Hitachi is bringing superior fundamental performance such as stable operation, high throughput, and high resolution to the forefront of technology. 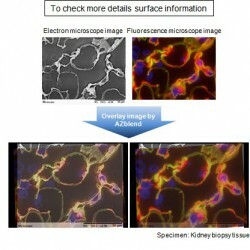 Image overlay and comparison verification software AZblend Call for price New information can be obtained from image overlay of Scanning Electron Microscope and other microscopes. 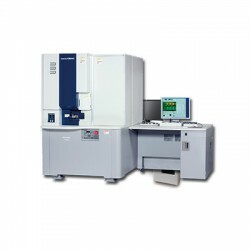 The completely new SU3500 SEM features novel and innovative electron optics and signal detection systems affording unparalleled imaging and analytical performance. Designed with intuitive logic, the new user-friendly GUI provides comprehensive image observation and display functions. 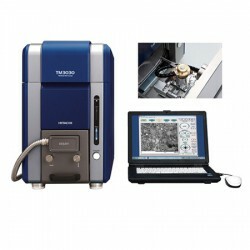 Engineered for a wide range of applications, including biological specimens and advanced materials, the SU3500 SEM will be the workhorse microscope in any laboratory. 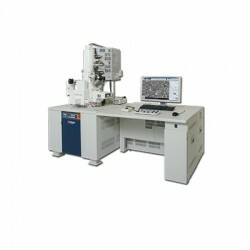 Scanning Electron Microscope SU1510 Call for price The SU1510 is a medium size chamber Variable Pressure SEM with the same performance and features as the S-3400N and S-3700N models. Quad Bias gun electronics greatly improves low voltage performance and increases beam current well suited for today's SDD X-ray detectors. Dual high-take-off ports accommodate two EDS detectors mounted 180 degrees apart for tice the analytical data collection plus eliminates X-ray map shadows associated with rough sample surfaces. A high speed, clean, efficient TMP eliminates the need for water cooling. 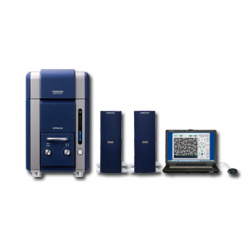 Compact, high performance and easy to use makes the SU1510 a great general purpose VPSEM for any advanced laboratory. 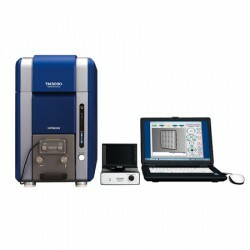 [VN] FIB-SEM Hybrid System XVision 200 Call for price [VN] FIB-SEM hybrid system equipped with Hitachi High-Tech Science's latest FIB column and high performance FE-SEM, and FIB-SEM-Ar Triple Beam system equipped with ultra low kV Ar column which can handle the small sample to 200 mm wafer deliver such as high quality TEM sample preparation, Cut&See realtime high resolution obervation and 3D analysis, and EDS analysis. 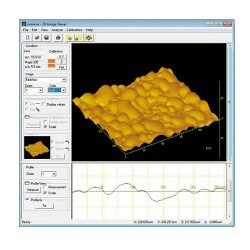 Optional Accessory for Tabletop Microscope TM3030/TM3000 3D-VIEW Call for price This software acquires three dimensional information on a sample by using BSE signal, displays bird's-eye view and three dimension display, and enables the height measurement of the sample.